History buffs and outdoor enthusiasts will enjoy discovering any and all of Northern Alabama’s Monte Sano Nature Preserve which offers more than 1,100 acres of beauty and 20+ miles of public trails. Only minutes outside Huntsville this treasure in plain sight, beckons hikers of all abilities, and ages. Unearth unique wildflowers, fossils, Railroad history, birding, the “Three Caves” site of several movies and more, as you traverse across bridges, over steep rocks and through beautiful hardwoods. 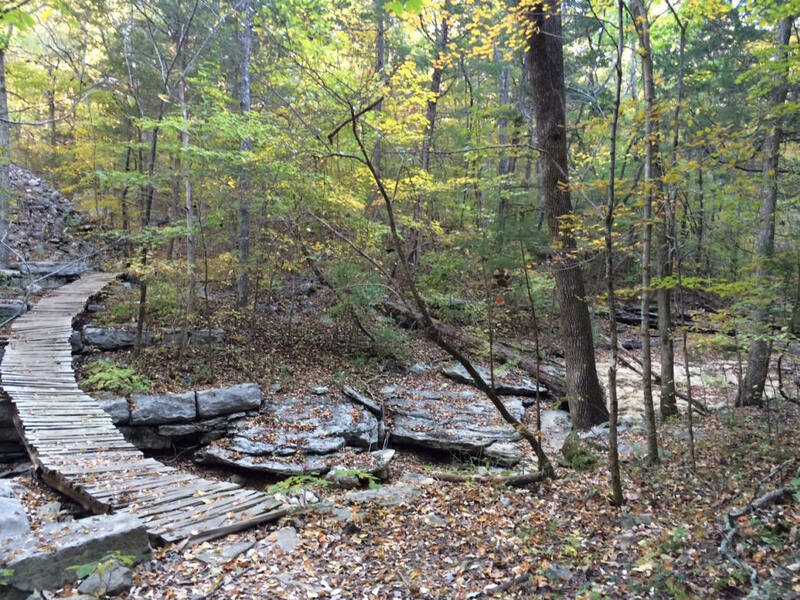 Monte Sano Nature Preserve is part of the Land Trust of North Alabama, with more than 20 trails and elevations from 700' up to 1500 feet. Guided hikes are offered throughout the year for public and members only. This slice of the southern Great Appalachian chain offers a rich history, including a steam locomotive railway and Horse and Wagon trails for hikers. Hikers who begin at the Bankhead Trailhead (parking lot) , have several options. If you’re short on time, try the Gaslight Trail, it’s a short loop if you connect with Toll Café Trail. 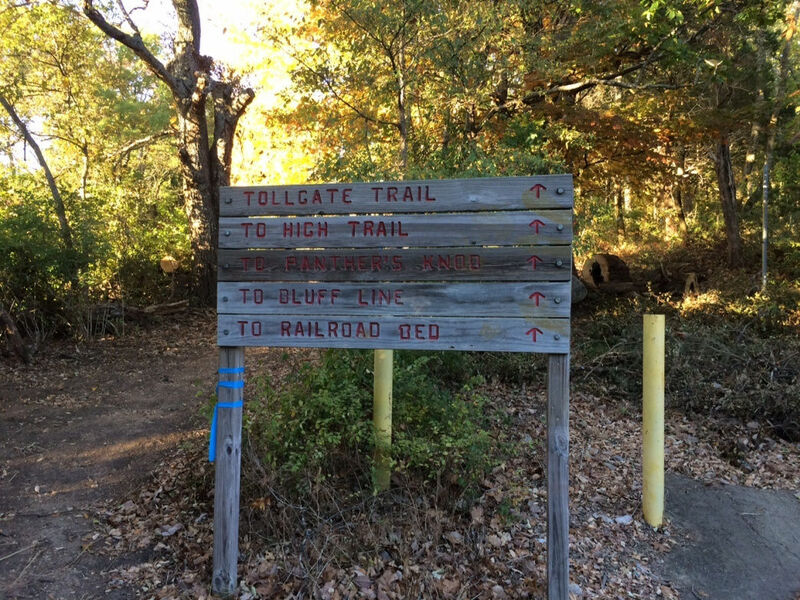 The old Railroad Bed Trail is popular and leads hikers to Belue, a connector to Alms House Trail, or Wagon Trail and further onto Wildflower Trail. A myriad of trails await the adventurous hiker from a swath of verdant fields, steep rocks, gravel, bridges, waterfalls, sink holes, stone foundations from the former railroad and scenic vistas with well-marked trails. The Old Railroad Bed Trail begins as a wide path on hard soil, then veers off with informational markers citing history paired with rocky terrain, large boulders and tall grass and vegetation. Listen for a variety of birds, as more than 150 species call this preserve home. Bluff Line Trail affords hikers a vigorous climb from the parking lot about 700 feet up to about 1400 feet. A labyrinth of footpaths and grooves offer many points of interest including: Three Caves, Wildflower and Dry Falls. Explorers can discover various habitats from any of the trailheads: Three Caves, Cleermont, South Monte Sano and Bankhead. Bankhead offers access to: Bluff Line, Toll Gate, Old Railroad Bed, Fagan Springs and Old Railroad Bed trails. The Wildflower/Cleermont parking area has access to: Wildflower, Fagan Springs, Wagon and Alms House Trails. South Mont Sano Trailhead is access to: Trough Springs, Discovery Trail and Bushwacker Johnston Trail. These trails are great for novices to expert hikers looking for a walk in the woods to relax or a challenging adventure. All ages can meander down a beaten path to explore part of history or a variety of habitats. History buffs, naturalists, team building groups, scout troops and other civic groups will appreciate this adventure time and time again, as each visit will reveal something different and special. Bankhead trailhead: From Alabama I-65 exit 340, merge onto I-565 E towards Huntsville. Take exit 19B for US-231 N/US-431 N/Memorial Parkway and merge onto N Memorial Parkway. Turn right onto University Drive NW which becomes Pratt Avenue NW then Bankhead Parkway. Cross over Toll Gate Road and continue up Monte Sano Mountain. Paved Land Trust parking lot is 1/2 mile further on right. South Monte Sano Trailhead: East on Governor's Drive to Monte Sano Blvd. Go north on Monte Sano Blvd., approximately 3/4 mile Look for historic marker across from entrance to Burritt on the Mountain Museum.